Genijalan je... jos onaj sat na njemu. ej strava! Hahaha Maja, you capture the most funniest things! Excellent and very amusing! 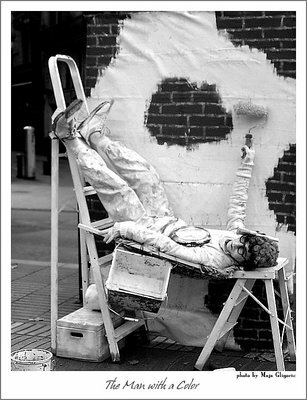 The question is which colour .. lol ..
Nice work on B&W ; a great street photo my friend! Regards. Excellent shot.Nice composition and tones. Very kind scenne and great your work for sharing dear! I would have stood for hours watching him and the antics he got up to - super photograph !